As many of you know, several weeks ago, an application developer named Dale Zak invoked the wrath of many webcomic creators with his Web Comics iPhone app. 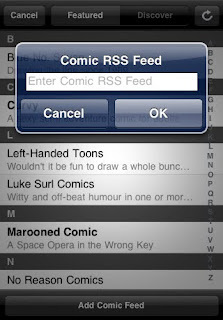 Although there were cries of content theft from many creators (and their fans), my own analysis suggested that the Web Comics app was a legal (if exceedingly clunky) RSS reader. Now Zak plans to release a new version of the app, and it sounds like he's made some of the changes creators and readers have suggested. I believe that all his promo shots include only comics whose creators specifically asked to be included in the application, and the new version lets you add additional comic RSS feeds. 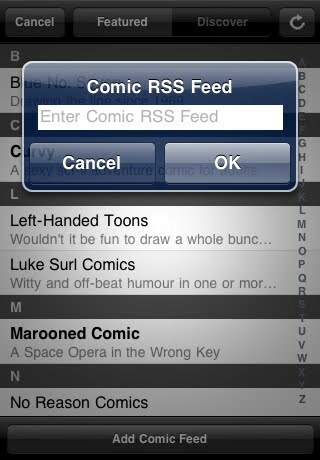 It also sounds like links to new comic feeds will appear based on the feeds app users tend to add. In other words, the new version of the app is a bit closer to a traditional RSS reader, and it makes Zak look a bit less like a publisher -- and, he hopes, smell a bit less fishy. We'll have to see if webcomic creators turn up their noses this time. Zak says that he has already submitted the new Web Comics app to the iTunes store and is waiting on approval. He doesn't say whether the app will be free. Will I be downloading the new Web Comics app? Sure, to play around with it and see how it works. If he releases an Android version, I might even try to use it on a daily basis. But I'm pretty content reading most of my comics through NetNewsWire and I'm not in the market for a mobile webcomics solution. I'm sure there are plenty of people who are. Mark my words, no matter what he does cartoonists will revolt against this kind of app. @rstevens: Do you feel rightly so? It occurs to me that I don't know how cartoonists feel about RSS readers in general (which is how I consume most webcomics, although I guess I'm in the minority). But does the fact that it's a mobile app make a big difference? I don't care to judge, but I've seen this happen a million times. Never ends well. Belt may be very good for way in the present day. However , simple most women has to be rather louis vuitton replica with each other. If you're not damaged during the ideal process will turn out threatening meant for simple most women. They are able to for no reason dress in belt approximately waist simply because it cutbacks body system towards several sections and likewise cuts down any size. Ideal strategy could be to dress in belt down the page any bust-line or simply dress in lower down regarding louis vuitton outlet uk. At the same time belt has to be slender possibly not comprehensive. Buckle should get slender in condition meant for designing a general benefit. Horizontally stripe apparel happen to be substantial HARDLY ANY meant for simple most women. Directory lines happen to be superior that will dress in as they definitely come up with silhouette for simple most women appearance for a longer period. Directory stripe apparel undertake terrific charms to the looks. Similar corresponds to patterns at the same time. Refrain from comprehensive together with diverse printed out apparel as they definitely louis vuitton replica uk everyone not as long. Directory structure patterns happen to be superior that will dress in and likewise grant picture for size. Stilettos or simply back heel boots or shoes would definitely be a simple option to appearance older together with leaner. Simple most women have to put them on. Handbag is certainly require device meant for louis vuitton replica uk however , all at once also remember the fact that specifications for container have to match body system quantity. Holding the on your mind simple most women have to refrain from great affordable handbags as they definitely normally deeper reduce size. Little chanel replica are appropriate for these people. Designs can be important take into account despite the fact that looking nicely put together. Simple most women. should go meant for monochromatic or simply simple colors dressing up. It is actually the easiest way to complement an individual's size. College life is like stairs for us and we can be professional best term paper writers if we study well and do not waste our time in foolish hobbies and activities. Nowadays mostly students think that colleges are just for enjoy their life but this is not true. New Perry Bible Fellowship. For Reals.